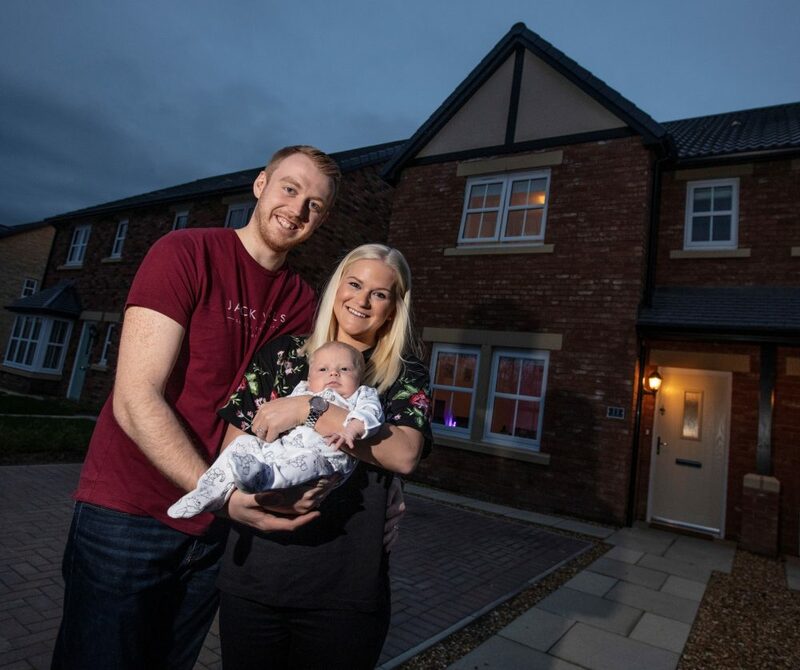 A Middleton St George family have used the government’s Help to Buy scheme to move into a brand new home of their own, just in time for the birth of their first baby. Matt and Katie Smith, who recently got married, chose our Paddocks View development for their very first home. Shortly after moving in they welcomed their baby boy, Ted, who is now six weeks old. Orthopaedic physiotherapist Matt and primary school teacher Katie had already lived in Middleton St George for five years, having originally met at university in Carlisle. Living in a rented property in the village, the couple watched the construction of Paddocks View progress from an empty field to the completion of our show homes. Matt said: “We decided to look around the show homes with no intention of buying at the time, but we fell in love with them! We immediately started saving with the goal of buying our first property with Story Homes at Paddocks View. 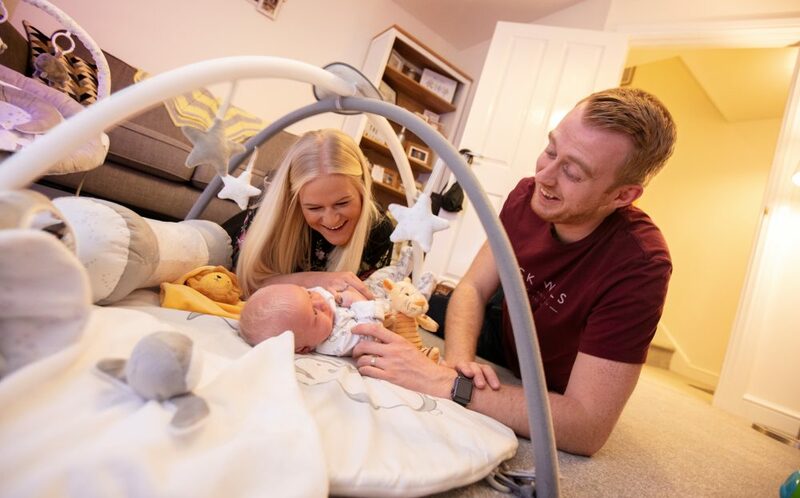 As first-time buyers with plans to expand their family, Matt and Katie decided on a new-build so that they could move in straightaway, without needing to do any renovation work. They also enjoyed being able to choose various options for the kitchen and bathrooms to personalise their home from the start. Using the Help to Buy scheme, whereby the government lends buyers up to 20% of the cost of a new home, the couple were able to get onto the property ladder sooner than they otherwise would have been able to, allowing them to fulfil their dream of starting a family in their own home. Although they looked around other nearby new-build developments, Matt and Katie soon made up their minds. They said: “Quite simply, Story Homes was a cut above the rest. No other developers offered such a high standard of finish, a wide range of options, white goods and turfed gardens at no extra cost. Sue, the sales executive, was so friendly and helpful too. 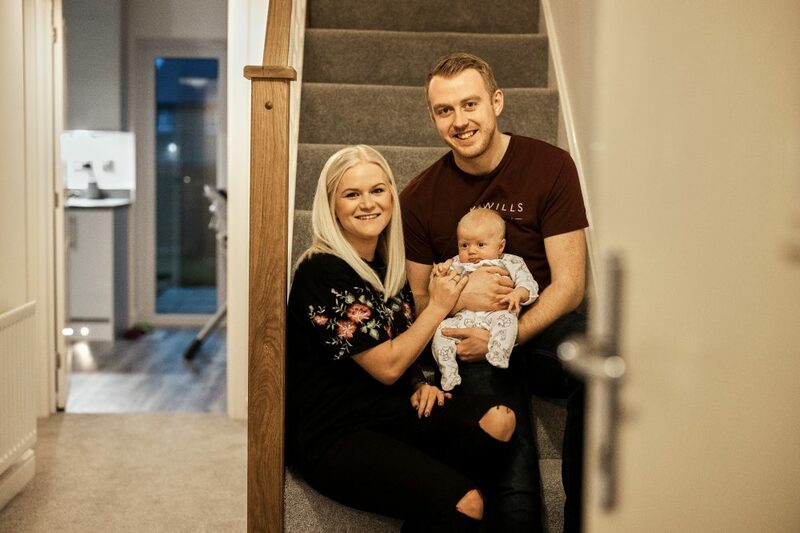 Lyndsey Walton, Sales Manager at Story Homes, said: “I am delighted that Matt and Katie have had such a positive experience with us and it is fantastic that they were able to secure their perfect home ready for starting a family. Find out more about the Hastings house type here. For further information, call our Sales Executive at Paddocks View on 01325 401 373 or email paddocksview@storyhomes.co.uk.